Former Afghan President Killed In Attack : The Two-Way Burhanuddin Rabbani was most recently chairman of Afghanistan's High Peace Council. 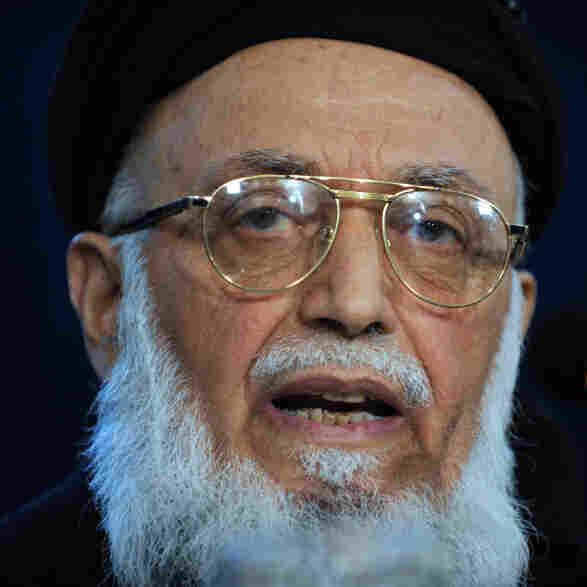 At attack at his home in Kabul has left former Afghan President Burhanuddin Rabbani dead, "two government sources" tell The Associated Press. Reuters also reports that Rabbani, who most recently was chairman of Afghanistan's High Peace Council, was killed. "Rabbani has been martyred," Mohammed Zahir, head of the Criminal Investigation Department of the Kabul Police, told the news agency. According to the BBC, "he was meeting two members of the Taliban at his home" when there was an explosion, officials said. "It is unclear if [the Taliban representatives] were involved in the attack." The Peace Council has been negotiating with the Taliban in recent years. An adviser to President Hamid Karzai was wounded, Reuters reports. About the same time as the attack at Rabbani's home, the nearby U.S. embassy sounded its "duck and cover" alarm warning of a possible attack there, Reuters says. A Tajik, Rabbani was "appointed president by the mujahideen executive council in 1992," the BBC adds, and "continued to be recognised by the U.N. as president of Afghanistan even after he was forced out by the Taliban in 1996. He was was forced to relinquish his post when Hamid Karzai was elected chairman of the interim adminstration in November 2001." Rabbani survived a Taliban ambush in August 2009. President Obama and Karzai, who are among world leaders at the United Nationsl today, just spoke with reporters there. According to the pool report filed for the news media by The New York Times' Helene Cooper, Obama called Rabbani's death a "tragic loss" and said the killing was "a senseless act of violence." Rabbani "was a man who cared very deeply about Afghanistan," Obama added. And he said that he and Karzai "both believe that despite this incident that we will not be deterred from creating a path whereby Afghans can live in freedom, safety, security and prosperity." Karzai called Rabbani "an Afghan patriot who sacrificed his life" and said that "this will not deter us from continuing down the path we have started." Karzai is planning to leave New York early and return to Afghanistan. Karzai, who is in New York for the opening of the U.N. General Assembly, said a short time ago that Rabbani's death is "martyrdom" and that he sacrificed his life for peace, The Associated Press reports. Update at 11 a.m. ET: From Kabul, NPR's Quil Lawrence tells the Newscast Desk that officials say two men who said they were Taliban members and wished to turn themselves in came to Rabbani's home, and that one of the men is suspected of having concealed a bomb.